Ready for the great outdoors? Take a weekend camping trip with friends or family, or go on a week long hiking expedition in the mountains. Rent It Today has everything you need to make your trip comfortable. Savvy campers who elect to not invest their money in rarely used camping supplies can simply and economically rent everything they need. Sleeping bags for hot or cold weather, tents for one person or an entire family, and backpacks to carry it all can easily be rented. 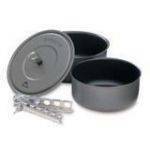 Rent supplies you need for cooking, safe food storage in Bear Canisters, and water purifying items. First time campers and seasoned veterans alike enjoy renting state of the art GPS units for hikes through the wooded mountains. Lanterns for the dark nights and knives to cut brush or use while cooking are also available, along with numerous other camping supplies. For your camping convenience and peace of mind, camping and hiking equipment can easily be located and rented to make your journey successful and easy on the wallet. Whether camping alone, with a small group, or a large family, you will need to find the right size tent to hold everyone and help protect everyone from the elements of the outdoors. When renting a tent, the first item to determine is the dimensions needed and not just the square footage. A one person, one door tent is perfect for a sole camper or hiker who doesn't have to share space with anyone else. However, a family camping adventure will require more room and possibly a two door tent. Two doors can help eliminate having to climb over each other when entering or exiting the tent. Besides dimensions, make sure to pick the appropriate tent for the season and weather conditions in which you will be camping. There are five basic tent types: Summer/Screen, 3-Season, Convertible, Mountainerring/Winter, and a Tarp. Each classification of tent offers distinct characters to provide the best protection for the elements you may have to endure. A Backerpakers Tent is best for an individual camper or hiker. Just the right size for a single occupant, it is lightweight and easy to roll up and store in your backpack. Sleep under the stars in comfort by knowing you have rented the right tent for your camping experience. The locale and season in which you decide to go camping determines what kind of sleeping bag you will need to rent. When camping in warmer weather, a "cool" sleeping bag is the appropriate choice. It is lightly insulated, and will keep a camper comfortable when the temperatures dip to around 45 degrees. Likewise, they are very lightweight, around 3 pounds, and easy to travel with. Fall through early spring camping calls for a sleeping bag designed for "warmth." 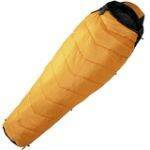 These particular sleeping bag rentals are extremely insulated, waterproof, and help seal in a camper's body heat. They work well to temperatures as low as -20 degrees. Both types of sleeping bags can be rolled down to the compact size a backpacker requires. The ability to rent air mattresses or a ThermaRest matress pad will also help make camping an enjoyable experience. It will make sleeping on the ground more comfortable. You can even rent a pump to make inflating your air mattress quick and easy. To keep a backpack lighter for the longer trip, renting a ThermaRest mattress is the best choice. A ThermaRest mattress offers a very restful night's sleep and is designed to fit in a backpack. Even though you are outdoors, you don't have to leave comfort at home. Camping is typically accompanied by some form of hiking. For short hikes, a basic backpack to tote essentials is your best fit. No matter the length of the hike, the backpack should be lightweight enough to maneuver the environment but also provide enough room to hold water, food, a GPS unit, and anything else you will need for a successful hike. 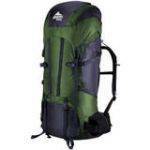 A large capacity backpack for rent is what is recommended for an extended excursion. When you plan on hiking for a prolonged amount of time, you will need to prepare for all the adventures that lie ahead including eating and sleeping. A large capacity backpack has room for all the basic essentials as well as cooking supplies, food, sleeping bag, and a tent. Find these items, and all your camping equipment needs at Rent It Today. And don't forget, renting backpacking equipment is also the perfect option to test out items before investing in them with a "try it before you buy it" intent. You'll certainly have a healthy appetite after a day of hiking and exploring outdoors. When it's time to cook up a satisfying meal over the campfire or camp stove, there's no need to buy all the neccessary items and accessories. Instead, simply rent camping cookware, stoves, and everything you need to cook in the great outdoors! You can rent pots, pans, silverware, coffee pots, and so much more. For campground sites, a larger two burner Coleman cooking stove is a great rental item. It is perfect for cooking at your campsite. Backpackers might choose a model like the "Pocket Rocket Burner Stove" for its functionality and lightweight portability. It is small, yet made to cook food quickly. Its design helps the flames stay lit even in windy conditions. A helpful hint when renting camping cookware is to rent pots and pans that can be used for mutiple functions. Aditionally, by choosing the most modern equipment, you are also deciding to lighten your backpack load. The importance of safe water for drinking and cooking while camping, hiking, or backpacking makes a water purifier and/or hydration equipment an imperative item to rent. The water purifier pump is a simple yet effective filter for purifying your drinking water. Germs, bacteria, and pollutants can lurk in any water source, and sickness or upset stomach is not fun anywhere, much less in the middle of nowhere. A water filter purifier is a safe way to hydrate and give you peace of mind. 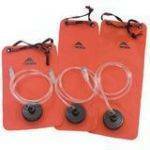 When doing more serious or lengthy backpacking, a hydration water bladder is strongly recommended and extremely useful. A water bladder is easy to carry, and, if needed, keeps water from a reliable source good for up to a year. This is very desirable for trips when safe water sources are not assured. Better to have it and not need it than vice versa! Your rental outfitter is a great source of information. They are happy to share their expertise, and this is just another of the many benefits of renting camping gear.